Saab 900 1980 : For interior comfort and safety the car was fitted with a new type of seat with vertically adjustable head-restraint. External changes were dual tail lamps and a new grille. A five-speed gearbox was optional on the EMS and turbo. 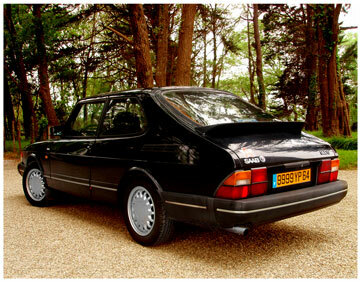 Shown at the 1980 Geneva Motor Show, the 900 Saloon (or Sedan) with a conventional boot went on sale as the 1981 model. Saab 900 1981 : Lots of small improvements were made : Interior changes were new rear seats, electric windows on some models, a larger fuel tank, a new front axle, a front spoiler made of rubber for the Saab Turbo, new wing mirrors adjustable from inside the car. The interior was made more spacious by making the floor tunnel flatter and remodelling the back seat. The spare wheel was moved to provide more luggage space. Externally, the Saab 900 acquired larger side mouldings. A lighter and more powerful H engine proved to be more economical and now powered all 900s. The term "H" indicated an increase in engine compression without the loss of power. The intake channels in the engine were made narrower so that maximum power output was not affected and fuel consumption improved. The GLE was now offered only in four-door with model designations in the USA becoming just 900 for the base model and 900S for the EMS. Saab 900 1982 : The big change for 1982 was the introduction of Saab's APC - Automatic Performance Control - on the Saab 900 turbo. Available initially only on the Scandinavian markets it was soon made a available to the United States and other markets. Automatic Performance Control enabled the engine to detect knocking tendencies and automatically adjust the charge pressure to raise the compression. In effect, this permitted the engine to be run on different grades of fuel. Saab 900 1983 : Central locking became a new feature for the Saab GLE and Saab turbo models and the wide-angle rear view mirror was made available to all. However, whether it was fitted or not was dependent on legal requirements in different markets. Leather upholstery became available for Saab Turbo models. If the pulling power of Saabs was good, then the stopping power was now enhanced with asbestos-free brakes. The specification list was further improved with a tachometer with economy markings on five-speed cars. Rear fog lamps and a DeLuxe equipment package with electrically operated sunroof and leather was an optional extra on the turbo. During the year a five door Saab 900 GLi with a fuel injected 118hp engine was released in Sweden. Saab 900 1984 : Saabs's innovation for 1984 was a new 16-valve engine with four valves per cylinder and domed compression chambers with the spark plug mounted centrally at the top, double overhead camshafts and hydraulic valve lifters. With an intercooler this engine generated 175hp. The 1984 Saab 900 model was easily recognisable by a new silver-grey grille with slightly rounded corners and the EMS, GLE and turbo sported a new three-spoke steering wheel. Previewed at the Geneva Motorshow of Spring 1983, the Saab 900 Turbo 16 appeared as a four door saloon and a three or five door hatchback.A special extra de luxe model, the 900 T16S "Aero" was available on certain markets in only black or silver. The car could reach 210kph. 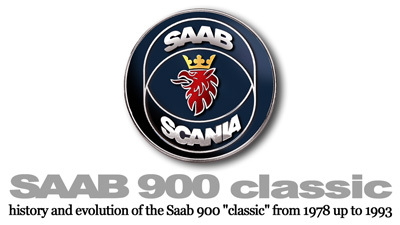 Saab 900 1985/1986 : New model designations were complemented by the new blue Saab/Scania logotype on the bonnet. 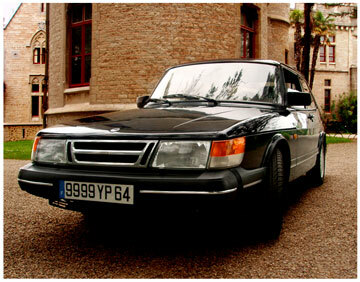 The Saab 900 became the base model : 100hp from a carburretor engine. The Saab 900i had a fuel injected engine generating 118hp, the Saab 900 turbo had 145hp and the 900T16S was 175hp. All Saabs now carried the new Saab logo on the bonnet, on the bootlid and in the centre of the steering wheel. Four door turbos got a new rear boot spoiler and all turbos got a chrome grille. In 1986, an intercooler was fitted to 8-valve turbos increasing power to 155hp. Hydraulic engine mounts were now fitted to 16-valve engines. A new, enhanced interior featured a rear seat central armrest and the main extaernally visible change was the introduction of side indicator repeaters towards the rear of the front wings. The first Saab 900 T16 Convertibles were assembled. The first 400 were shipped to the USA.